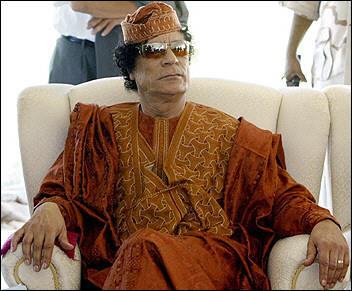 Colonel Muammar Gaddafi has been the leader of Libya since taking power in a 1969 coup. The last time I felt this way was waking up one morning to see the World Trade Center towers billowing smoke across the New York City skyline. Now it is as if the Arab world is waking up, and the winds are blowing revolution across the skyline of Arab capitals throughout the Middle East. There are times in life when you feel that history is unfolding before your eyes. The winds of change are blowing and the storm seems to be growing rather than subsiding. The calls on the streets of Arab cities for democracy – from Tunisia to Egypt, and now Bahrain, Libya, Yemen, Jordan, Algeria and Iran, and others still – are catching the world off guard. I have heard many pundits confidently describe the differences between what happened in Egypt and Tunisia and what is now taking place in other countries. Could the same happen in Libya? No, one pundit remarked, Colonel Gaddafi has a much more heavy-handed grip on power than what Mubarak or Ben Ali employed. Bahrain? No, said another, the country has historically enjoyed greater stability than its neighbours. One thing has become clear over the last six weeks: Punditry over the limits and the possible extent of revolutionary fervor is not as valuable as the pundits would like us to believe (The irony of writing this is not lost on this pundit). One wonders whether the same pundits were toasting a bright future with Tunisia’s Ben Ali and Egypt’s Mubarak on New Years. The problem, it would seem, is that pundits, along with many Western leaders, are still looking at these events in terms of reform rather than revolution. Reform happens within a system; change, when it comes, is relatively limited and can be contained with small concessions to the demands of reformers. Revolution, on the other hand, is a fundamental restructuring of the system; change, when it inevitably comes, is far-reaching and cannot be contained. Reform is what most Western leaders have been calling for, and what most pundits have been considering as most likely. But their mistake is looking at current events as if they are a predictable part of the system. But reform is nothing but a facelift on the status quo. And a facelift on the status quo is not what Arabs are filling the streets in order to fight for. With events unfolding to this degree, I do not believe that protesters around the Arab world are going to be placated by mere reform, no matter how much Western leaders would like it to be so. Reform may have stability on its side, but stability has not brought reform to the peoples’ side. I think most citizens living under tyrannical dictators would agree. The historical events now taking place should be viewed as revolutionary in nature, rather than reform based. And revolutions, perhaps unfortunately, tend to be a game of picking the right side. The sides in this case are fairly clear: Dictatorial, oppressive leaders or democratic, freedom seeking protesters. From my point of view, Western leaders should be doing a much better job picking the right side. Sitting on the fence for too long risks falling on the wrong side. And I sure don’t want my government – or tax dollars for that matter – ending up in support of anything but the fundamental freedoms I enjoy. If stability has to take a shot in the arm so that other people in the world can enjoy what we enjoy, I’m all for it. If Western governments continue to deal with nefarious regimes throughout the world after those regimes violently crush legitimate opposition, I’m definitley not for that. I suppose there is only one course of action that I support: Get behind the people. Use our political and economic clout to push brutal, violent, and tyrannical regimes toward fundamentally restructuring their political systems along the lines of the liberal democratic principles that we apparently cherish. Western governments are best served, in the end, by supporting what they claim to stand for, and what protesters are demanding: human rights and democracy. As for each Middle Eastern leader ruling without the consent of his people, the lesson is just as clear: reform or perish. Who’s next? You’re next. Next Libya and the United Nations: Hypocrisy, Oh Hypocrisy!